396 color & 47 b-w illus. 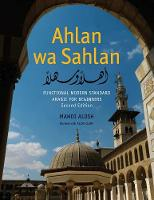 The second edition of this widely used text covers the first year of instruction in Modern Standard Arabic. It will teach students to read, speak, and write Arabic, while presenting an engaging story that involves Adnan, a Syrian student studying in the United States, and Michael, an American student studying in Cairo. In diaries, letters, and postcards, the two students describe their thoughts and activities, revealing how a non-American views American culture and how the Arabic culture is experienced by an American student. This edition features online video, filmed in Syria; expanded communicative activities; an updated audio program; and material designed according to proficiency principles. Mahdi Alosh was the associate dean for international affairs at the United States Military Academy and also taught Arabic at The Ohio State University for 17 years. Allen Clark is an Arabic instructor and the director of the Arabic program at the University of Mississippi.